The Card Grotto: Hope Your Day Is Awesome! Hello there, I am back! I now have my new PC but please bear with me as everything is different! 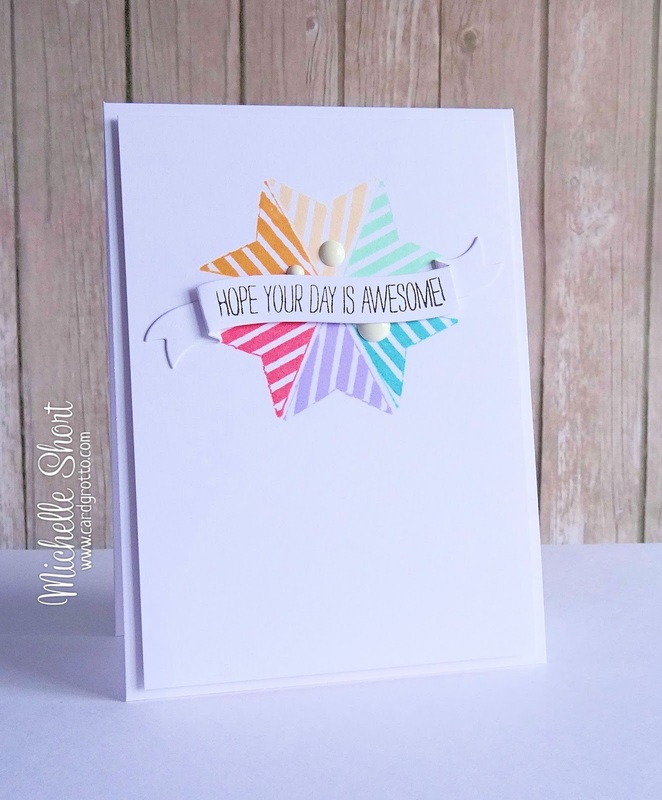 Anyway, I am here (a little later than planned) with a card from the new Simon Says Stamp This Is The Life release. I have used the new Life's Journey stamp set for my card. I have first taken the arrow image from the set and stamped this in various shades of SSS and HA inks on to a white card panel. I have then taken the Tilted banners die and cut this from white CS. The sentiment from the Tilted Banner Sayings stamp set has been stamped on using black ink. This has been popped up with foam tape in the centre of the arrow images. I have then finished off with a few Doodlebug Sprinkles and popped the panel on to a white card base with more foam tape. So, I never realised that Windows 8 was so different from Windows 7! I think it is going to take me a while to get used to it. Also all my settings in Paint Shop Pro have changed too so the photos might look a bit dodgy while I am getting back to grips with it! Thanks so much for visiting me today and thank you all so much for your support while I have been away. Stunning card Michelle. I love your design and wonderful colours. I think I may need to upgrade my PC soon but I have heard so many people struggling with Windows 8 it really puts me off! What a beautiful card,Michelle! I love how you used the arrow and the pretty colors! Your photo's look great! I know it's difficult getting used to new computer, but I think your photo's are fab! !